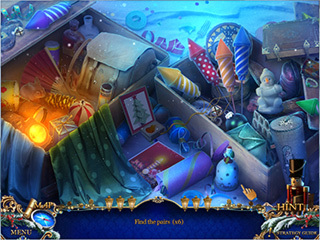 Elephant Games have turned another a classic story into a great hiddenobject puzzle adventure game. Christmas Stories: Hans Christian Andersen's Tin Soldier Collector's Edition is a wonderful take on the story of a tin soldier. The game's audio-visuals are very Christmassy. It is winter, and there is a lot of magic in the air. The story is a bit complicated in this release. It is about Albert the nut-cracker but also about Nina (Albert sister) and Charlie (her fiance). A baron is after Nina's heart, but she is in love with Charlie (they weare about to get married, but he was called to war). The baron did everything to get rid of Charlie even after he was back without a leg. Join the adventure and rescure the three and the rest of the toys from the vengeful and jealous baron! The hidden object scenes come in different forms: lists, silhouettes, and pairs. The nut-cracker is your hint provider. Charlie participates in some of teh puzzles. You are to complete three animated screensavers as you collect puzzle pieces across teh game. Another collectible item for you is miniature cats. 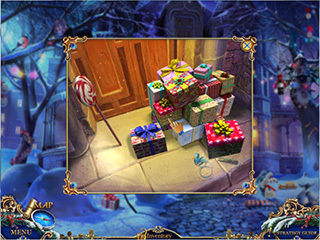 The game is a wonderful Christmas adventure with a lot to tackle and find. Christmas Stories: Hans Christian Andersen's Tin Soldier Collector's Edition is your magic get-away place for the season. This is Christmas Stories: Hans Christian Andersen's Tin Soldier review. Download this game here.